Global food company Danone has signed up South Yorkshire lone worker experts Peoplesafe to look after more than 200 of its employees in the UK. Based at Dinnington, Peoplesafe is the brand for lone worker safety solutions offered by Rocksure Systems Ltd. Partners, SoloProtect (formerly Connexion2) are the manufacturers of the award winning Identicom device. Two divisions of the multinational company, Danone Nutricia Early Life Nutrition and Nutricia Advanced Medical Nutrition, have given special devices to 200 field staff, so they can call for help if necessary while out and about. 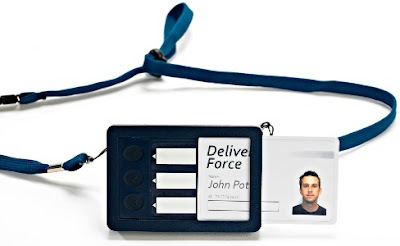 The device, an Identicom 877, looks like a name badge, but has an alarm button on the back, which calls through to Peoplesafe's monitoring centre. Gerry Jarvis, Danone's head of safety, said: "As a responsible employer we take the well-being of our employees very seriously and their safety is a priority for us. "We do training to make sure all employees understand the importance of safe lone working practices, so having the Identicom gives us back up assurance. Our teams now know that help is only a button push away should they need it." The 200 employees issued with the Identicom include 100 nurses who work for Nutricia Advanced Medical Nutrition who visit patients' homes to provide medical nutrition products and check on associated equipment. The Identicom also has a GPS locator, so people can easily be found in an emergency. It is one of a range of products supplied by Peoplesafe, which is one of the UK's leading providers of simple and lightweight equipment, training and monitoring services for lone workers. Ian Johannessen, managing director at Peoplesafe, said: "We are delighted to be working with Danone and helping them keep their staff safe doing the valuable work that they do. "There are millions of lone workers in the UK doing important jobs, whether they are working in the health field, working in shops, protecting premises or delivering groceries. These are vital jobs and all the personnel deserve protecting."